Imagine watching the Super Bowl, the players huddle, “Hup 1, hup 2, hup hup” the quarterback receives the ball, dances side to side looking for a running back player near the end zone, spots one, lobs the ball. The running back positions himself under the ball, metres from the dancing zone and, drops the ball. How frustrating for the dropper, the thrower, and the whole team! Now imagine a World Series baseball game, a team with superb batters and skilled pitchers, but every time the opponent thwacks the ball high, ripe for a catch, the fielders drop the ball, every single time. The team who keeps dropping the ball will always lose. This reminds me of how freelancers and entrepreneurs approach sales and marketing, and one particular new business comes to mind. They invested in over £4000 in creating smart freebies, hand-delivered them to their shortlist of dream potential customers. 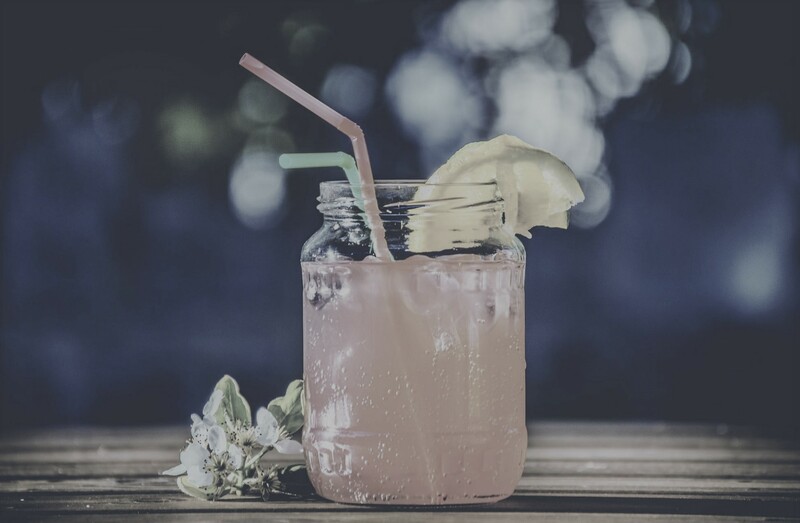 From a marketing perspective, it ticked the boxes: it was cute, memorable and personalised. But that marketing stunt resulted in zero sales because they didn’t know how to turn those potential clients into a sale. They’re not the only ones, you’d be surprised how many freelancers and new business owners get this wrong. Often it’s because they don’t know the distinction between sales and marketing, since these two terms are often bunched together. They’re both distinct skill sets. Let’s have a quick look at the difference. Marketing’s focus is one-to-many and long-term. Marketing is the process of taking your products or services to market, which includes the 4Ps: Product, Price, Promotion and Place. Activities such as advertising, events, branding, public relations, direct mails, digital marketing all form part of the marketing mix – each activity being a distinct skill. Marketing also looks after the brand’s reputation. Sales’ focus is person to person and the short-term. It deals with detailed ambiguities of each individual customer and adapts to each individual customer’s preferences, psychology and behaviour. 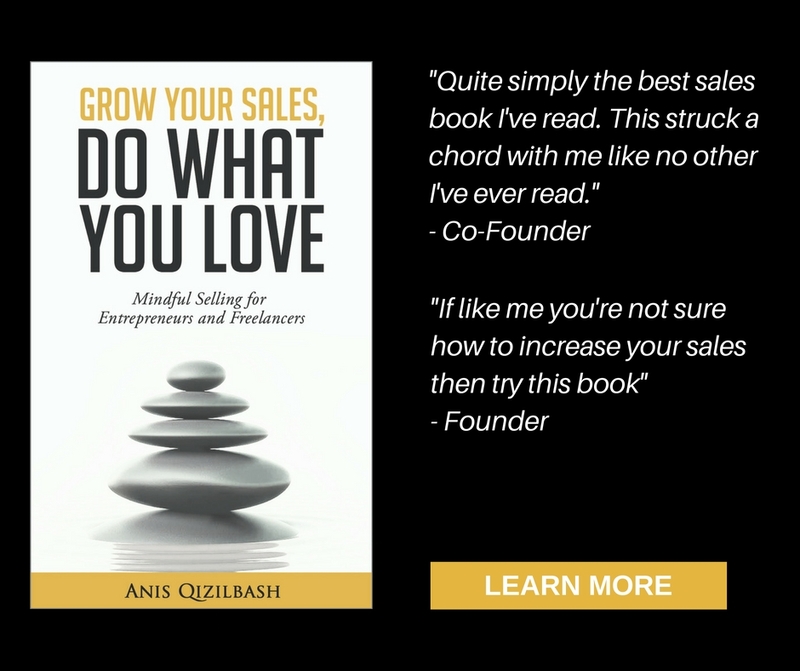 Sales should know the individual’s pains and dreams, as opposed to the average, blanket general goals. Crucially, through interpersonal communication, sales turn the interested prospect into cash in the bank. 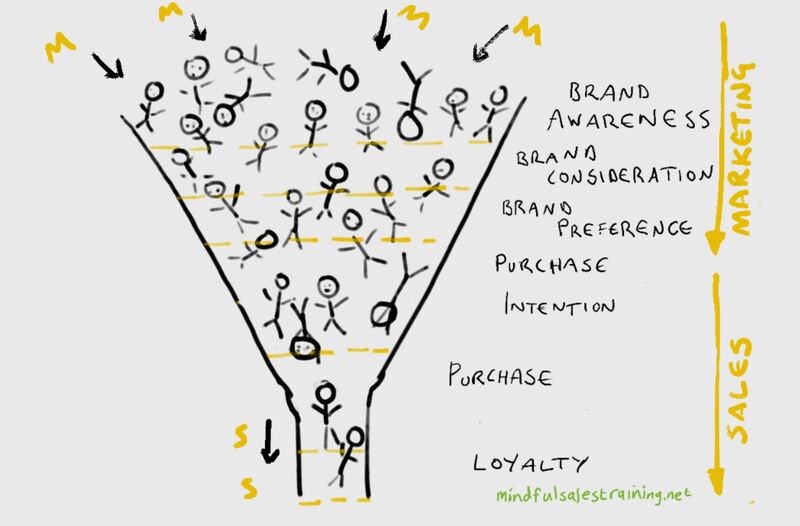 Both functions have a common interest, which is to grow revenue by managing a thing called the Buying Funnel – it’s a funnel shape, like the diagram below. Marketing’s 1-2-many function aims to get as many people from the target audience into the top of the funnel, as possible, by raising awareness through PR, advertising, SEO, social media and so on. Then keep as many in the funnel by helping them consider the brand and prefer the brand, through more branding advertising activities. The qualified prospect is passed over to sales, who works with people individually, helping them buy. Just to point out one activity that stands on its own: using your phone and emailing (cold calling) is more like a straw, than a funnel. You’re focussed and direct and you go get it, rather than waiting for people to fall in the funnel. So now you know the difference between the two and how they work together. As a freelancer or new business owner with finite resources, where should you start or focus? This WSJ article by Jessica Livingston points out selling, not marketing, should be your first focus. Airbnb, a mass consumer product perfectly suited to digital mass marketing; in the beginning, the founders approached hosts individually to help hosts convert better. The founder met and stayed with hosts to hear their pain points and made improvements based on their suggestions. Nestle, another traditionally mass consumer, one-to-many marketer, were failing with Nespresso. 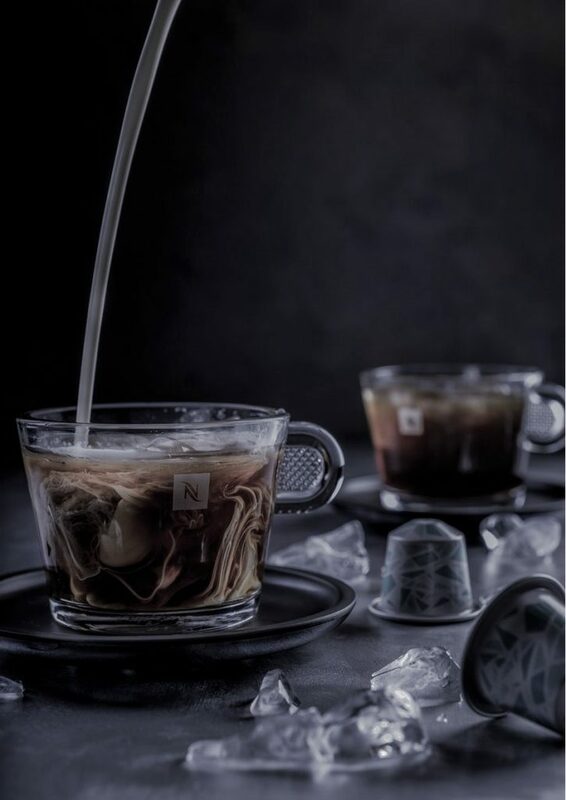 To get Nespresso off the ground they adopted a completely different approach; they started direct selling, one-to-one selling, by approaching hotels, first class and business class lounges, airline operators and big companies, to get them to buy the machines and coffee. This tactic got a wide audience to test the product first. And the rest is history. You can’t sell yourself as a Rolls Royce offering when your website looks like a Lada. Equally, spending your time on social media, blogging or attending events, when you don’t know how to convert conversations into sales, is a waste of time, money and opportunity. The trouble is, since marketing sounds sexier, most people start there, neglect the ikky selling part, and end up dropping balls because they don’t know how to sell. How much time do you spend on marketing and how much on sales?